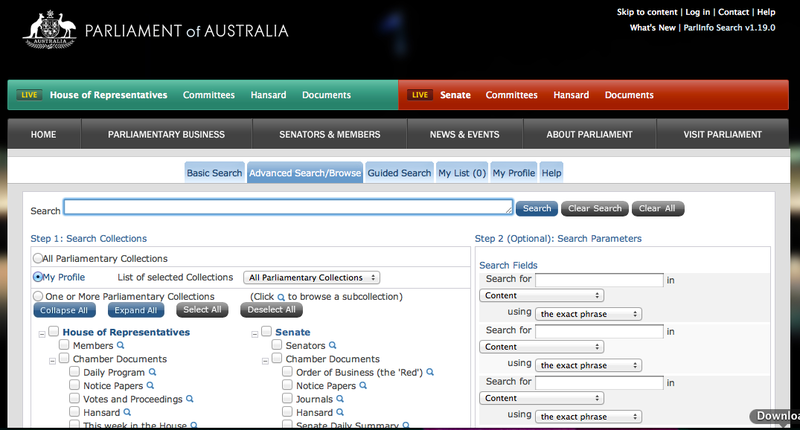 Parlinfo Web is the online version of Parlinfo, the Austrialian Parliamentary Document Repository, an archive with over one million documents concerning the various activities of the Australian Parliament. Parlinfo Web offers a comprehensive access to databases, speeches, bills, MPs bios and to a vast amount of related official and institutional material, from Senate briefings to weekly summaries and general transcripts. Draft records of the proceedings of the chambers have been recently included. Overall the website content has several layers of information, with a fairly distributed outline and easily accessible pages. Most documents are available as text and html formats, with many pdf files as well. Live broadcasting for both Senate and House of Representatives is also possible (if possessing the needed softwares). Users have fully open access to the whole repository through browsing, search and direct links to the most requested documents. Free access to the various databases and areas is provided through a series of structured options: simple browsing, a step-by-step guide search and several quick links. Several search options are also provided, along with numerous help pages and a faqs section. Navigation is quite intuitive and successful, due to the site’s effective and simple design.